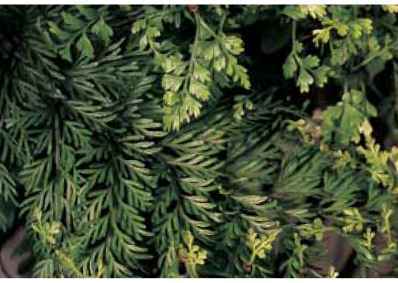 Synonym Asplenium trichomanes subsp. pachyrachis Epithet is after Erno Csiki, a late nineteenth-century Hungarian beetle specialist. pinnate with 10 to 15 pairs of overlapping blue-green pinnae. Sori are in a linear herringbone pattern with matching indu-sia and are produced on very young plants. Bulbils crowd the fronds on Asplenium bulbiferum. 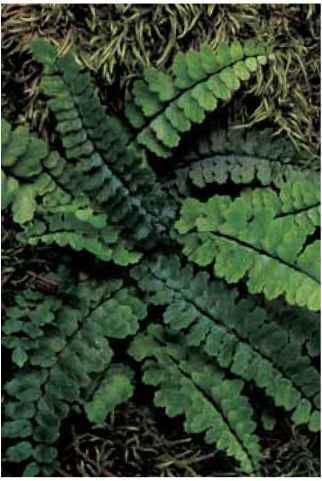 Asplenium csikii 'Trogyense' is a rock garden treasure. similarity to Asplenium trichomanes, it likely goes unrecognized more often than not. culture and comments: A charming miniature that splays like a starfish on rocky fissures, it is best in coarse, well-drained container culture. I have added very small bits of broken concrete to serve as slow-release lime. The attractive 'Trogyense' has deeply lobed pinnae. description: The rhizome is erect. Stipes of up to one-half the length of the frond are plum colored with dusky scales. Fronds of Asplenium ebenoides arch in the familiar pattern of its parent, Camptosorus rhizophyllus. A robust Asplenium fontanum in the Gassner garden. Blades are lanceolate and irregularly divided from once-pinnate at the base to lobed, pinnatifid, or entire at the apex. Reflecting the influence of Camptosorus rhizophyllus, this hybrid will occasionally tip root. Sori are linear with linear indusia. 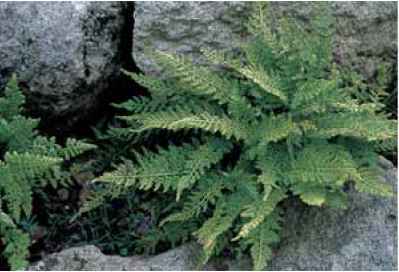 range and habitat: Dragon tail fern was first discovered on limestone cliffs along the Schuylkill River outside of Philadelphia, Pennsylvania, in 1866. 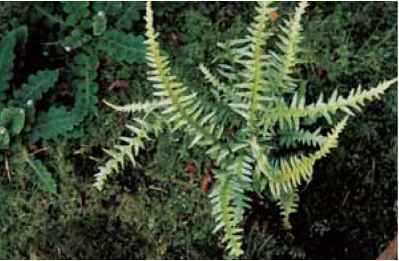 It has since gained considerable status in scientific research as "the most famous hybrid fern" (Flora of North America 1993), and was one of the first to be recreated in a laboratory in 1902. Primarily of limestone and/or sandstone habitats in the eastern United States, it has been sterile in the wild except for one location in Hale county, Alabama. Spore-grown progeny from the fertile colony are now widely available commercially. culture and comments: The dragon tail fern is a curiosity with its variable frond configurations even on the same plant. Slugs find it equally fascinating. I have had entire populations disappear overnight and now have mine planted in a hollow in a limestone rock which in turn is well off the ground on a display table. 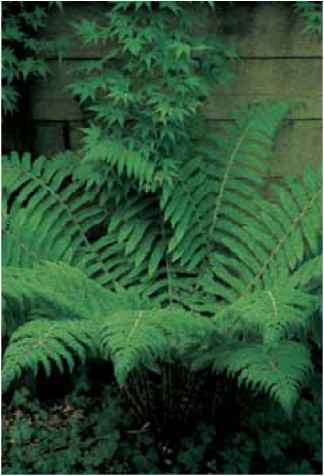 With its unusual, rather unfernlike dimensions, as well as its history, this fern is well worth special attention to its welfare. It is also the parent of the exceptionally unusual tri-generic hybrid with Phyllitis scolopendrium, which is worth even more attention for the fortunate few who may own this coveted rarity. 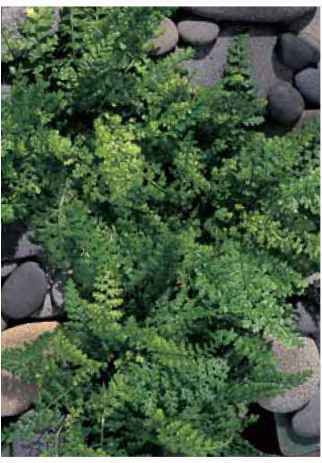 The dwarf form of Asplenium fontanum is an excellent selection for a trough or small, rock-protected setting.